Standard PCR measurements were used except that a new 50X dNTP mix was used in place of the 5X buffer used in all previous PCR reactions. The amount of dH20 was adjusted for the new quantity of dNTP mix accordingly. 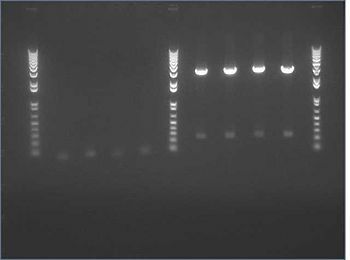 As this was our 3rd or 4th or 5th unsuccessful Barnase PCR Oliver checked the primers to discover a glitch in the forward primer, it seemed to have some extra nucleotides inserted and also had some complementarity to the adjacent gene on the plasmid barstar. New primers will be ordered. We ran an xba/pstI fast enzyme digest on our miniprepped NosT + stop and v0120 plasmid. 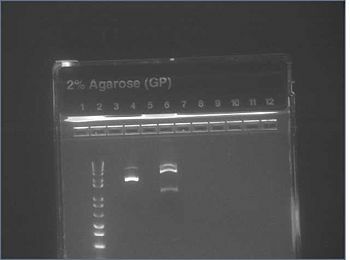 The gel was consistent with a successful ligation. (See lanes 7-10 in gel image below). This page was last edited on 26 September 2017, at 19:06.